This chip might bring a new future competitive with the DDR3 technology, the new technology is named ST-MRAM got an ultra-low latency and a high performance, a high endurance compared with the current DDR3 chip, the implementation of this technology in the market will be far from now because of the small size with only 64MB on one chip, check out the press release bellow for more details from Everspin . The 64 Mb device is the first product in Everspin's ST-MRAM roadmap that is planned to scale to gigabit density memories with faster speeds. Select customers are now evaluating samples of Everspin's EMD3D064M 64 Mb DDR3 ST-MRAM. "The properties of ST-MRAM are particularly appealing to the enterprise SSD market because of its ability to enhance and complement flash memory technology," said Joseph Unsworth, research vice president at Gartner. "The commercialization of this technology is an important industry milestone that should continue to drive SSD proliferation in data center and in-memory computing architectures." The first semiconductor memory that combines the speed and endurance of DRAM with the non-volatility of Flash, ST-MRAM gives designers of high performance storage systems the ability to achieve ultra low latency, increase reliability with high cycling endurance and protect data in the event of power loss. One example of potential use is in the area of cloud storage—even as more users and content are added, faster and consistent data storage access is a necessity. ST-MRAM gives system designers the benefit of persistent, high endurance storage or memory for applications that demand better reliability and that need the performance boost of DDR3 speed. The 64 Mb density MRAM provides an ideal entry point for non-volatile buffer and cache memory in solid state and RAID storage systems as well as storage appliances. The 64 Mb device will complement existing low cost memory technologies, reducing overall system cost and complexity. Everspin is manufacturing ST-MRAM on its 200 mm production line in Chandler, Arizona and is collaborating with industry leaders to establish 300 mm MRAM tools and additional fab capacity. 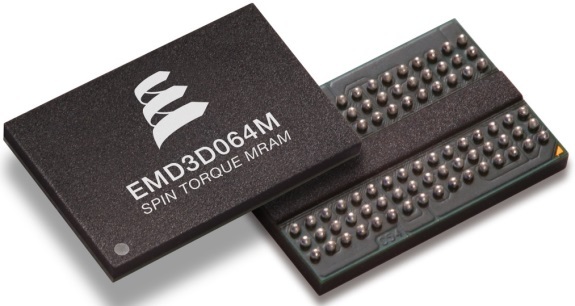 Everspin is also working with design partners to ensure that the required tools and support are in place to drive the rapid adoption of ST-MRAM, including the necessary memory controllers, memory modules (DIMMs) and evaluation platforms. Everspin is shipping working samples of the EMD3D064M 64 Mb DDR3 ST- MRAM to select customers and will announce details on broad availability in 2013. In addition, Everspin is offering ST-MRAM non-volatile random access memory modules in industry standard configurations, and PCIe FPGA platforms are available now allowing customers to start designs.